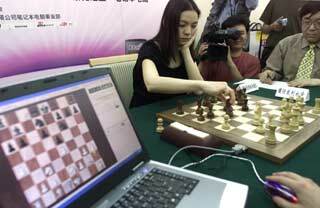 In this corner, Zhu Chen, the women's World chess champion. On the other side of the table: the Unisplendour Star laptop, developed by the Tsinghua Unisplendour Corporation. In head to head competition, the air was tense. After two hours had passed, it was the human who cracked. Zhu Chen accepted defeat, with the unemotional computer snatched the lead in the two-game series. The next game is set for June 12. Compared with Deep Blue, the 1,270-kilogram super computer that defeated World Chess Champion Garry Kasparov in 1997, the Unisplendour laptop possesses powerful data-processing ability but looks the size of a common notebook computer. "It is one of the most powerful chess-playing laptops in the world. And in the game, I am so happy that it has stood a severe test from the world champion," said Li Zhiqiang, CEO of Tsinghua Unisplendour Corporation. Stepping out of the chess room, Zhu looked still as calm as before the game. She admitted that after falling into a stalemate, she was not content to a simple draw. "At that time, I felt that I could launch an offensive. However unfortunately, I made a big error. Not like human being, the computer will never lose any winning chance," she said. In fact, she did not allot time properly in the game, she said, which led to several hasty moves near the end. Also, an anxious state of mind in the deadlock put her at a great disadvantage. Comparatively, it is the biggest advantage for the computer, never having emotion or knowing fatigue. Zhu said there are still some questions about the game that remain unresolved for her, things that will need to be summed up together with her teammates and trainers. "I will strive for a better play in the next game," she said. "The game should have finished in a draw," said Ye Jiangchuan, the chief coach of Chinese National Chess Teamand also the on-the-spot commentator. "If she was experienced with the machine, she would not have broken. However, her thirst for victory made her commit a fatal error." He also expressed his great appreciation for the reasonable moves made by the computer. "The combination of computer technology and chess has greatly promoted the spread of the game in the world," Ye said.